Teens have reported an increase in bullying with severe consequences to themselves and their schools/organizations. As if this were not enough, bullying has been identified in a national & international studies as a factor in the recent mass shootings. This campaign is designed to prepare those trained as facilitators to work with students, their parents, community organizations. The name of this program describes it: Bullying Stops when Respect Begins. This is the theme of bullying & Cyber bullying prevention. Those who lack respect for themselves are more likely to be victims of bullying. Those who lack respect for others are more likely to be bullies. Those who lack respect for how technology can harm are more likely to become cyber bullies. Those who lack respect for their school are more likely to stand-by while others are being bullied. A school that lacks respect for the students, staff or the education process is more likely to tolerate bullying or bullying themselves. Therefore, respect is the basis for preventing bullying. We must arm ourselves with skills, techniques to intervene and prevent Bullying from happening. This is not just another Anti-Bullying Training. This is a School/Organization Social and Emotional based program. Research also suggests that friendship acts as a buffer for bullying's harmful effects. Finally, teaching assertiveness, empathy, and emotion management to students promotes their social & emotional development. 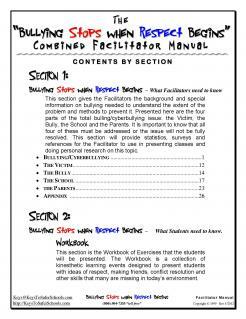 The Victim: How to handle being bullied, to stop the victimization.. The Bully: How to identify the need for bullying and help them develop better ways to meet that need. 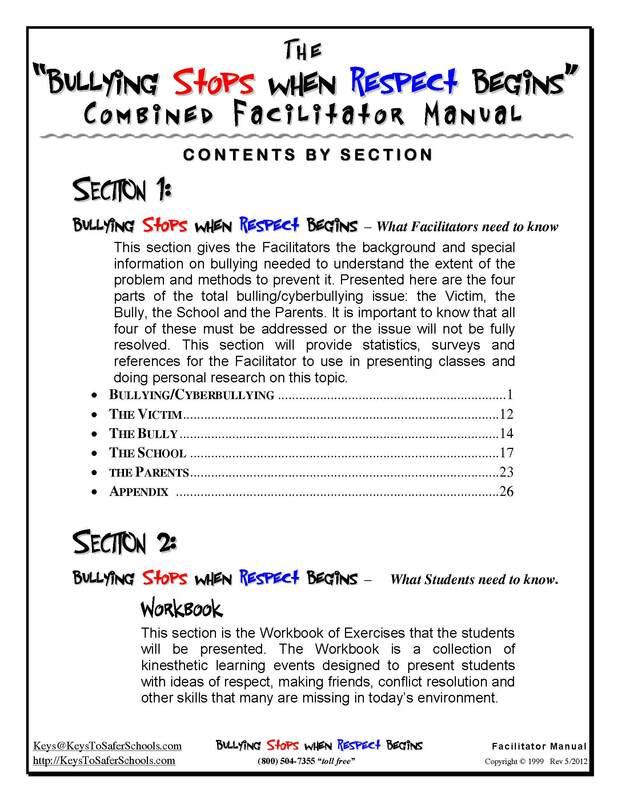 The School: How to deal with both sides of bullying in a productive manner. Learn what youth organizations can do. The Parent: How to recognize signs that your child is being bullied, how to help your child cope with bullies and how to interact with the school /organization about a bullying situation. This Online Training comes with our Extensive eBook Combined Guide and Student Workbook. 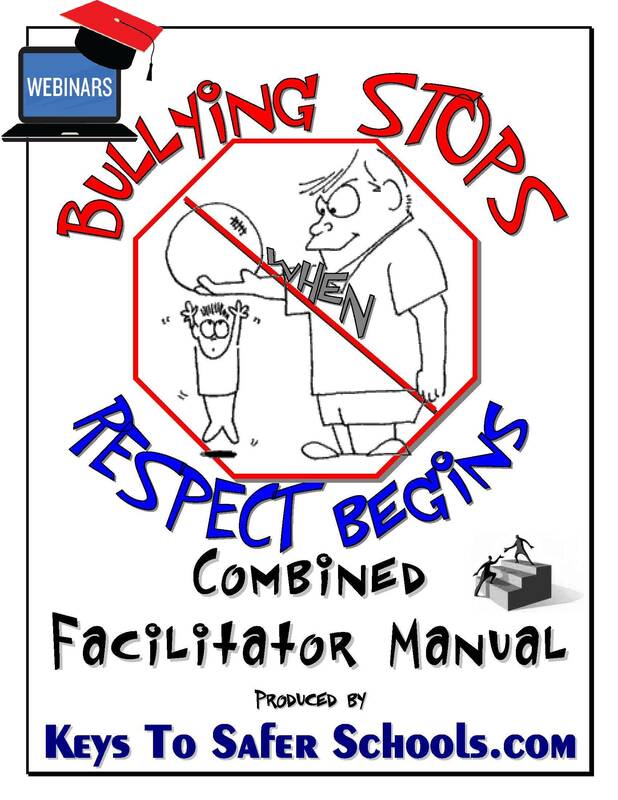 The BSWRB's Facilitator combined book and student workbook ebook - Bullying Stops when Respect Begins is based on International level research and contains information to combat Cyber Bullying, emotional, and physical bullying by developing both an Anti-Bullying Program and a Respect Campaign. This Online Training and ebook provides information on how its program/curriculum can be embedded. That is, the ideas presented here are not intended to be offered in a class then only discussed when that class is in session. Rather, the concepts are intended to be integral parts of every area of the school/organizations experience. Regardless of the class, playground or extra-curricular activity, respect should be taught, expected, reinforced and praised. There should be special times set aside for working through exercises in the provided workbook and once each week students should meet in groups to allow them to look back over the week and admit failures, tell of successes and praise others for acts of respect. As each student goes in turn he or she will describe what was learned about respect this week, what was done to earn the respect of others, and what was done to return (or show) respect for others. These groups should be small enough that everyone has opportunity to interact. The teacher facilitator must keep the comments moving and on target. Once Complete with Training you will be provided with a 2 year Certification and a Certificate of Completion for CEU Credit. Class Length : 1 1/2 hours Once purchased the training; you will be sent an email with information of the ebook download instructions. Training is available for Teachers and School Administrators dealing with bullying and developing effective policies on bullying. Keys' can assist your school with Parenting Training and the development of Support groups on recognizing and dealing with bullying.